Dr. Michael J. Pagliaro, with his wife, Dr. Marie M. Pagliaro, founded AMIS in January of 1972. They were responding to a crying need for a musical instrument service which would seek a profit by serving the musical needs of the public as opposed to having the public serve as a victim from which to extract a profit. Michael is a retired college professor, holding a B.S. in music, an M.A. in music education, and a Sc.D. in musical instrument technology. He is now CEO emeritus at AMIS dealing with broader issues in the company. Marie is still active as a college professor and heads the division of teacher education at a New York college. She holds a B.S. in chemistry, M.A. in science education, and Ph.D. in curriculum and instruction. She too acts in an advisory capacity in the family business. 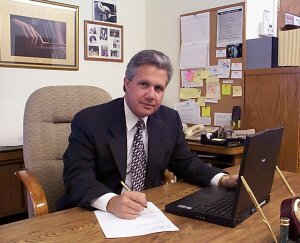 Michael J. Pagliaro, Jr., the President of AMIS is a hands-on administrator and supervisor. A genius with mechanical matters and an entrepreneur extraordinaire, it is no surprise to see him utilizing his training in business (he holds a Bachelors of Business Administration) by consummating a deal via the Internet for the purchase of 100 violins in Europe and then turn around to “heal” a wounded bassoon which any other technician would pronounce DOA. If you want to buy it, or sell it, he will deal with you. If it doesn’t work, he will fix it. If there is a problem, he will solve it. His staff of 7 technicians, all of whom he has trained (Michael is also an occasional adjunct instructor of musical instrument technology at a local college) enjoy working with and for him.